"Astonish Me" is a book I should not have started during finals. 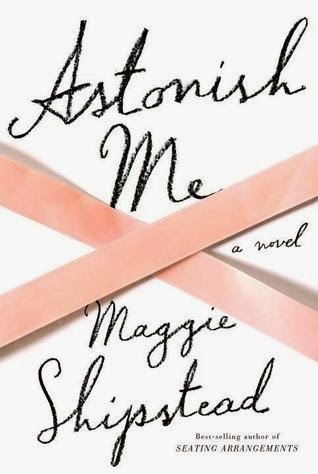 Maggie Shipstead's debut "Seating Arrangements" was lovely, witty, and charming, but I was not prepared for the emotionally-involving, tightly-plotted "Astonish Me." Joan is a ballerina in the corps (the ballet equivalent of the chorus) of a New York City company when she helps celebrated Russian dancer Arslan Rusakov defect by driving him across the Canadian border in the mid-70's. The novel explores how that act and her subsequent relationship with Arslan shapes her life and that of those around her. Covering events from the 70's to the near-present, the novel is both sweeping and intimate in scope. It's also worth highlighting the solid audio narration by Rebecca Lowman for those who listen. The structure of the novel bounces through time, divided into several parts that internally proceed chronologically. When each new part begins, it re-sets to an earlier part in time, shedding light on moments given new significance with the additional information the reader now knows. It's not as complex as my poor explanation makes it sounds, and it works wonderfully. The structure allows it to cover a sweeping span of time, while intimately focusing on a specific set of characters whose lives intertwine and dramatically impact one another. The characters - Joan and her family, the family next door, and Joan's dancer friends and colleagues - are each remarkably unique and well-developed for a fairly short novel. I cared about them all, despite their faults. The desire to know where their lives would take them and why they made certain choices kept me listening long past when I should have returned to my casebooks. And the conclusion! The story was well-told and the characters well-drawn, so I likely would have been content no matter how the book wrapped up. But the final scene pushed this novel into superb territory. It is both a perfect capstone and an illuminating resolution of the book's open questions. It highlights and adds depth to the themes of love and art and the intersection of the two. Verdict: Affirmed, for all lovers of literary fiction, but particularly for fans of dance. Read it & let's discuss that last scene. "Astonish Me" by Maggie Shipstead, narrated by Rebecca Lowman. Published in audio on April 8, 2014 by Random House Audio.